We were invited to attend the Brighton’s Sea Life Claws press launch yesterday which will be an added attraction when it opens on April 22, 2017! It was our first time in Brighton’s Sea Life and I was thrilled about the event as they were going to unveil its latest installation, the ‘Claws’. At the entrance, a staff member kindly asked us to sit and act as if we were beneath a giant crab for the family photo as a souvenir. Please note a price for the photo maybe charged. 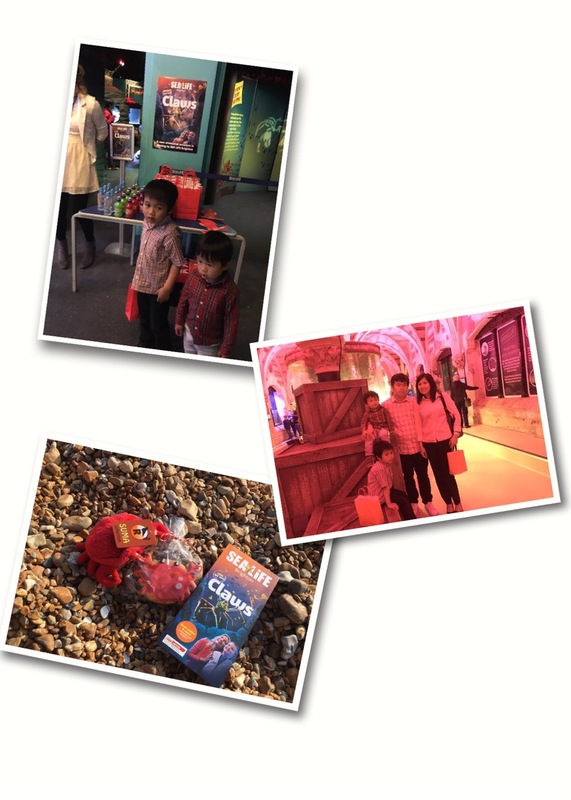 As we approached the ‘Claws’ entrance, my children were given goody bags, each contained a crab plushie and complimentary voucher tickets and a cookie shaped in a crab….how fitting! Each ticket is valid for 1 adult to see the aquarium; colouring papers, pencils and information about ‘Claws’ were also provided. My kids were very happy with their goody bag! As we entered the ‘Claws’, a member of staff welcomed us and shared knowledge about the crab species found at Sealife. It was a new experience for the kids and they have enjoyed every moment of it! The stars of the show were the 2 japanese spider crabs. The largest of the crabs, which were previously located at Sea Life Helsinki, had a leg span of a whopping 1.3 metres and can grow to the size of the car. We also got to see the peacock mantis shrimp, one of the most brightly coloured animals in the world. We enjoyed viewing all the tanks which showcased the sea creatures such as velvet crabs, starfish and green urchins. There were also tropical cray fish and large land hermit crabs. The brand new installation ‘Claws’ at Sealife, Brighton is definitely worth seeing for the whole family. Witness its beauty and have the chance to see the spectacular shellfish and crabs. A must see for everyone that will surely not to dissapoint. When we finished the ‘Claws’ we also had a scenic view at the aquariums and marine world. It was refreshing treat for the kids as their imagination glow. We were captivated by the beautiful view of the ocean tunnel aquarium. We got to see the animals up close at different perspectives and angles. There was a lot for the kids to explore, such as sharks, turtles, stingrays and many more! Sea Life Brighton was definitely one of our best family day outs and educational for our children. They discovered sea creatures and expressed their imagination. Like them correlating it from Disney’s Finding Nemo when they saw the clownfish and Pacific blue tang. The staff at the Brighton sea life were lovely. They were able to provide us another complimentary photo as the first one has our son’s face a bit covered. It’s good to know that refreshments are available at their cafe with free WIFI!